And after about a hundred million years: Episode 4 arrives! This episode includes music by: Escape From Saturn, Demons of the Craft, Nomore164, Splinters in Hand, and These City Limits. ***Edit*** If you enjoy this serial and want to help the book get more exposure please take the time to go here and enter to win the free copy of the paperback being given away at Goodreads.com and/or share the link I just mentioned with your friends and social networks please! Finally got some recording done tonight... Still looking for more music for this episode, but I'm getting some help with that. I'm so glad I know how to remote from one computer to another. Made my recording process very doable with using the closet as a vocal booth. So, yeah Shining in Crimson Episode 4 coming soon for real this time. Now that everything's set up, I hope to be able to put out an episode every week until I'm done. We'll see how that works. Bear with me here, I'm having what I call a "moment of stupid." If someone downloads a digital copy of something online would they have really ever bought it in the first place? Or does that mean now that they've downloaded it that they will never buy it? Or anything else from that rapper, coach, or beautician? Is it also impossible that their downloading said file could spread the word about the author, doorman, or architect of the pirated file in question? I mean lets think about what all happens when someone downloads a file from the internet for free. 1. They smile, knowing they just got something for free. 2. They experience what they've downloaded by listening, reading, or watching it. 3. They either like, love, dislike, hate or feel indifferent to what they just experienced. Now's where the branching really begins. In this example let's say it's a book and they've never read a book by the author of this file. Let's call the book "I Stole it on the Internet" by Captain Jack Lots-a-files. Tommy will be our guinea pig for this exercise. Tommy downloads "I Stole it on the Internet" and reads the book. Scenario 1: Tommy hates it. Yeah, Tommy thinks it's the worst book on stealing things off the internet ever. Hell, Tommy read a much better book on this subject last week and it was free so he didn't even have to steal that one. So, Tommy then goes on with his life now knowing he doesn't like the way Captain Jack Lots-a-files writes. Oh well, Tommy wouldn't have bought it anyway. No loss. I think we can safely say the same would likely happen if Tommy dislikes it or feels indifferent to it. Scenario 2: Tommy loves it. Tommy loves every detail of "I Stole it on the Internet" right down to Captain Jack's description of how to use fancy downloading programs like Bittorrent and Peer-to-peer apps right on to how Captain Jack even lists all the best sites to find just what Tommy's looking for. Tommy likes the book so much that he will likely do one of the following: Either he'll buy it, tell his friends, or buy another book by Captain Jack. Now, it may not happen overnight but one of these things will happen unless Tommy lives in a cave and has no outside contact with the world whatsoever. In which case Tommy would be highly unlikely to have internet access to begin with. Now, does everyone who downloads files and loves them turn around and do these things? Not necessarily. There may be a few people out there who don't. But I don't know about you, when I love something, I tell people, I check out more of it, etc. But mostly I want other people who haven't experienced this beautiful thing who might enjoy it to join me in it's awesomeness! Now this scenario is more difficult to predict. It's possible the person could more likely go either way with this one. But even if you just like something it usually stays with you and when you see other things related to it or connected with it in some way you tend to want to repeat the experience. Anyway, that's enough with Tommy and his pirated copy of "I Stole It on the Internet." When it really comes down to it, especially when it comes to books, is it just me or does this all just really sound a whole lot like going to a library and picking up a book? I'm sure some of you are arguing that you don't keep the book and that's true. But chances are people don't read the same pirated book over and over again and not feel guilty about it. But that's just my opinion on the matter. Goodnight everyone. It's here, finally! 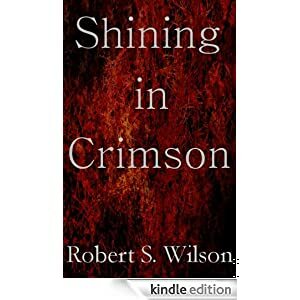 Shining in Crimson is now available for Kindle! Shining in Crimson, Empire of Blood Book One is now available for Kindle on Amazon.com, Amazon.co.uk, and Amazon.de! And very soon it will also be available in other formats on Smashwords as well. And the best part is that it will be available for only 99 cents until January 1st 2012. Then the price will go up. So, get it while it's cheap!